Until recently the Tokyo office of Hilton Worldwide had been located in the nearby Shinjuku Hilton Hotel on a floor designed for hotel usage. Rising demand for hotel space on the backdrop of increasing tourist numbers and operational deficits because of the compartmentalized hotel layout triggered the idea to move to an office building. 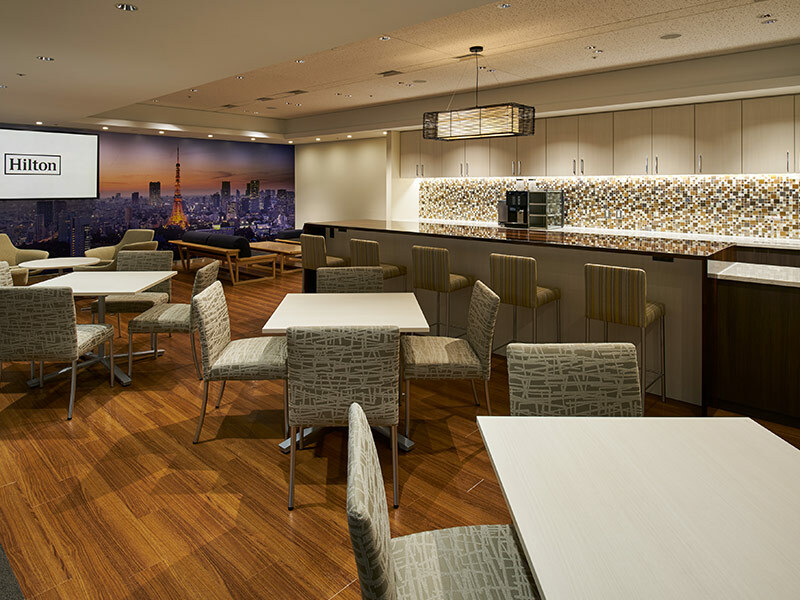 Shinjuku Oak Tower, located in proximity to the Hilton Shinjuku hotel was selected as the new space. All workspaces are grouped in islands in an open office setup with exposure to daylight. All support spaces and meeting areas are grouped along the building core creating good visibility throughout the office. The ceiling of the enclosed spaces at the core is dropped and accentuated with a line of indirect lighting. The selection of materials together with the lighting concept is toned down with warm colours creating an analogy to hospitality spaces found in hotels. 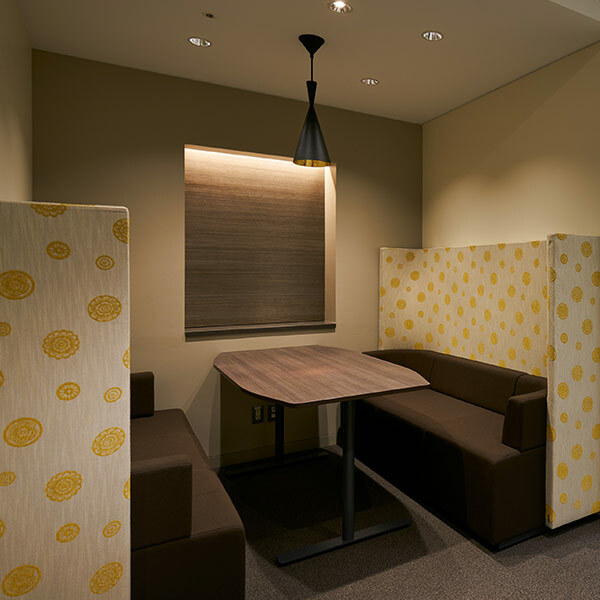 Meeting room wall patterns covered with Japanese paper (washi) and carpet patterns with Japanese motifs help to establish a local flavour to the design developed by OPX Design, Hilton’s global designer in the US. A central breakout space with a generous kitchen and seating which can be also used for casual meetings is an integral focal point of the office. 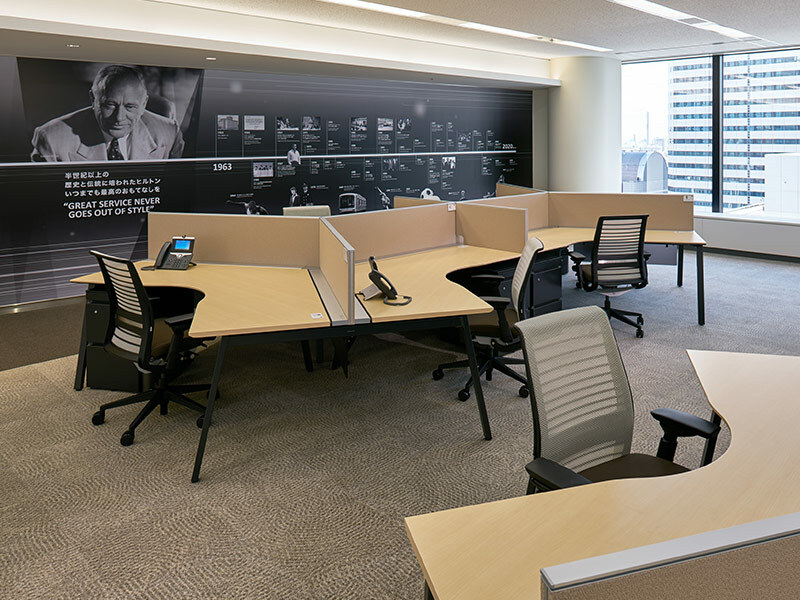 Huddle rooms spread throughout the office and meeting niches complement a setup of various meeting options. Graphic walls referring to the location and the history of Hilton create the necessary brand awareness.